Sonic the Hedgehog may be the star of a number of great and dreadful games these days, making his modern reputation much less compelling than it was when he debuted to show Sega and their 16 bit Genesis console a force to be reckoned with. Arguably his most memorable efforts lie within the original trilogy launched for the Gensis between 1991 and 1995 - and so, without waffling on, let's rank each one from the least ambitious to the most memorable in what may be quite an obvious list for many, but one I've still been keen to go ahead with. Advertised as the sequel fans have been waiting 16 years for, Sonic 4 was released in two parts across multiple systems - Episode I in 2010 and Episode II in 2012. Episode I's launch was backed by a fair bit of hype considering the game's promises to recapture the tone of it's Genesis predecessors - and while it's critical reputation is far from negative, many fans don't quite see it as the successor the originals deserved when looking back years on. Sonic 4 is a worthy effort to emulate the classics without mindlessly cashing in on their fame, but it doesn't quite capture their magic, mainly due to some incredibly frustrating level design. Now, such flaws that are present in both episodes are also flaws the orignals themselves carried at times - it seems these are glossed over simply because of their classic status. When all is said and done, both episodes of Sonic 4 are enjoyable and fast paced platformers, just forgettable for the most part and content to recycle ideas from the originals with new perks rather than designing new concepts from scratch. The visuals may seem cheap to some, but I liked it's simplistic nature, though would've much preferred the useage of Sonic's traditional design. Either way, both episodes are decent platformers, though Sonic Mania looks much more like the true sequel we've been waiting over two decades for. The original Sonic the Hedgehog is a unique and highly addictive platformer for it's time, even if certain aspects haven't aged as well as others. What's immediate from the get go is, as with most games in the series, the vibrant visuals and memorable music, introducing us to some of the most iconic themes of the series that remain impactful even today. Level design is where things truly come to fruition when it comes to assessing the game's innovative appeal back in the day - a balance of challenging platforming and fast paced gameplay is achieved, which makes this far more than running to the right as fast as possible. The game's key flaw lies with it's difficulty, which can sometimes feel unbalanced - Labyrinth Zone is of course what comes to mind when we discuss such a thing. It's good that the experience never feels too easy, but don't be surprised if you have to repeatedly spam the level select code even if you're far from new to the game. That aside, it's still ranks as one of the Genesis' best titles, and the merit it holds of launching the blue blur's career is enough to make it a treasured classic for sure. Often considered the best of the series' best installment by many, Sonic the Hedgehog 3 also ranks as one of the highest scoring games of the entire franchise - for good reason. Building upon the much loved formula in a number of ways, Sonic 3 is a huge step forward from it's predecessors in terms of visual prowess for a start, featuring vibrant, detailed environments dotted with superbly animated sprites. Things are also more interesting from a narrative perspective, as this is where we were of course introduced the beloved Knuckles the Echidna, who seeks to protect Angel Island from Sonic after being fooled into thinking he's the villain by the tenacious Doctor Robotnik. The gameplay is what fans have come to love - speeding through beautifully structured levels, but never bereft of detailed platforming segments that require a lot more skill than it may initially seem. This introduces a fresh level of diversity and challenge into the core format, and although it can be frustrating like it's predecessors, this doesn't stop it from being a superb experience from start to finish. Of course, another memorable trait is the ability to play as the aforementioned Knuckles, with his gliding ability making way for a multitude of new ways to tackle the most challenging stages. Whilst I don't consider it my favourite of the series, it comes very, very close, and Sonic 3 is still one of the Genesis' best games without a doubt. Probably one of the first games I ever played as a kid (alongside countless other Genesis titles), Sonic 2 remains my fave of the series to date due to it's amazing improvements over an already superb formula that the original comfortably established. 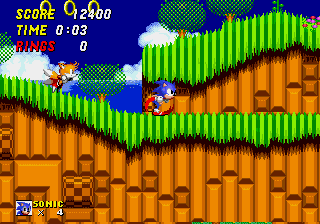 The game introduced Sonic's beloved friend Tails to the series, with him appearing as an in game sidekick that either the CPU or a second player can control. It's a shame he doesn't fully work out either way though, in hindsight, with the AI being fairly dumb and the game being a little too fast to follow for the second player should they choose to join in. 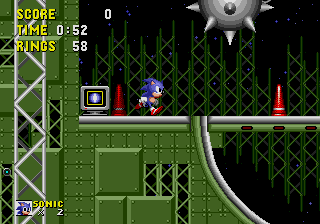 But Sonic 2 remains one of my fave games to date for a number of reasons, be it it's colourful visuals, superb soundtrack, and it's varied, creative level design that's both challenging and great fun. There's a stronger emphasis on speed than in the original, and the difficulty, while still a bit harsh at times, is noticeably more balanced, with a reduced focus on beginners traps and difficulty spikes. Perhaps it can feel a bit repetitive at times and equally frustrating during certain parts of the latter stages, but all in all, it stands as my personal favourite of the four main titles and probably Sonic's best 2D outing of all time.